Onboard the medical research space vessel USM Auriga, Lt. Ellen Ripley (Sigourney Weaver) was brought back in this fourth film set 200 years later in the year 2379. Science officers cloned her (from blood samples "from Fiori Sixteen on ice"), and then surgically extracted the alien chestburster baby-embryo that had been implanted inside her body (before she had suicidally sacrificed herself in the third film). The United Systems Military (USM) decided to keep her alive, naming her "Number 8." Due to the cloning process, she was a bionic, super-humanly strong warrior queen who had inherited genetic traits from the alien, and had acidic blood. She was well aware of the alien's deadly powers: "She'll breed. You'll die." 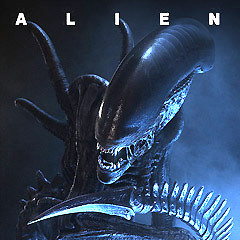 The extracted alien baby grew to be a full-sized queen (called "wondrous"), and was kept alive by a secret military faction led by General Perez (Daniel Hedaya) for their nefarious objectives (villainous Dr. Wren (J. E. Freeman) described for Ripley the promise of "...urban pacification, new alloys, new vaccines"), including producing a new generation of spawned adult aliens. They brought special cargo of kidnapped, hyper-sleeping space travelers (or frozen medical "experiments") on board, which were covertly used in the Auriga's med labs - to be impregnated with alien facehuggers. Crazed scientist Dr. Jonathan Gediman (Brad Dourif) was continually taunting a captive Alien creature with behavioral modification techniques, realizing: "So we're a fast learner." Call offered to kill Ripley: "I can make it all stop. The pain, this nightmare, that's all I can offer you," and then realized that Ripley, who had died 200 years ago, was now a cloned, superhuman who had bred an alien queen for the scientists ("You're a thing, a construct. They grew you in a f--king lab. And now they brought it out of you"). Ripley added: "Not all the way out." Annalee asked: "You gotta help me stop this thing before it gets loose," but Ripley warned her: "It's too late. You can't stop it. It's inevitable...You'll never get out of here alive." For secretly talking to Ripley, Call (along with her fellow crew members) was suspected of being a terrorist, and they were charged with possessing concealed weapons. When they were confronted in the mess hall, the mercenary freighter crew killed off some of the Auriga's members. In the meantime, there were massive security breaches when Dr. Gediman mistakenly put two adult aliens in the same cage - and when they attacked each other, the acidic blood from one of them burned an escape hole. Call informed her crew that the scientists were conducting "illegal experiments... breeding an alien species. More than dangerous. If those things get loose, it's gonna make the Lacerta Plague look like a f--king square dance." Adult aliens escaped and the creatures attacked and killed almost everyone onboard (including General Perez), as the ship's "Father" computer declared the main vessel uninhabitable. Some successfully evacuated, while one Alien followed others into an open hatch and devoured them. The surviving smugglers from The Betty (after Elgyn was killed), including hostage scientist Dr. Wren, Marine DiStephano (Raymond Cruz) and surviving Alien host Purvis (Leland Orser) ("with one inside of him...There's a monster in your chest"), attempted to evacuate the Auriga and escape before destroying it. They risked having Ripley accompany them - according to Call, Ripley would "turn on us in a second...She's too much of a risk. We have to leave her...We can't trust her!" When Dr. Wren and DiStephano told them that the Auriga, since the attack, was set on an auto-pilot course to return to "home base," they were determined as a group to stop the genetically-engineered, hungry creatures (a dozen of them remained) from being unleashed on Earth in about three hours, by crashing the ship. During their progress through the damaged ship, Ripley (calling herself at one point "the monster's mother") discovered museum-displayed capsules of alien/human cloned monstrosities, and her own deformed hybrid-clone (who in anguish demanded: "Kill me") - she took a flame-thrower to everything. And then the group proceeded to swim underwater, in an exciting swim-chase sequence through the flooded ship as they were pursued by aliens and attacked in an "ambush" of face-huggers from multiple pods. Call was revealed to be an advanced robotic droid after Dr. Wren betrayed the group and shot her in the chest - and she survived. Call manually programmed the USM Auriga to crash-land on Earth, in order to kill all the onboard aliens, while the remaining survivors (Christie had been killed) attempted to navigate a clear path to reach the Betty for evacuation before the crash. Meanwhile on their way, Ripley sensed that the new alien Queen mother was in pain, and was suddenly dropped onto the Queen herself through trap-door flooring. Once the beleagured group reached the Betty, Dr. Wren appeared and held Call hostage, but he was killed when Purvis attacked him and held him from behind. Both of them died gruesome deaths when the chest-bursting Alien emerged out of Purvis' chest and through Wren's forehead - and they (and the Alien) were pulverized by gunshots. Ripley discovered, from Dr. Gediman who was encased there in the nest, that the Queen had acquired a "human reproductive system" from her, meaning that she could give birth from a womb rather than from eggs or hosts. Ripley witnessed the birth of a slimy half-Alien, half-human, skull-faced "Newborn" hybrid creature (Gediman called it a "beautiful butterfly") that she watched mercilessly kill its own alien Queen mother after birth. It then licked her face with its reddish tongue, believing it was her mother. When the "Newborn" joined the surviving crew members (including Ripley) inside the Betty through an open hatch as they launched away from the Auriga, Call was cornered and seized by the "Newborn," and DiStephano lost his life trying to save her. Ripley rescued Call by eliminating the attacking monster (aborting it, in a sense) - she caused a small pinhole to open up in one of the viewing windows into space with some of her acidic blood. As the two held on, the vacuum in space caused the creature to be violently sucked out through the tiny hole (after Ripley said: "I'm sorry"). The USM Auriga spaceship crashed into North America five seconds later. Those on the Betty escaped the full force of the detonation impact, and with two other crew members (Vriess and Johner), Ripley and Call landed safely on the bombed-out Earth. Ripley congratulated Call: "Well, you did it. You saved the Earth." They marveled at Earth's beauty, and as they wondered what would happen next, Ripley told Call: "I don't know. I'm a stranger here myself." The film was the least successful of the franchise. It was the only film in the four-film series without any Academy Awards nominations. With a production budget of $75 million, with box-office revenues of $48 million (domestic), and about $161 million (worldwide).